Pyskool is a remake of Microsphere's Skool games written in Python and Pygame. It's designed to be very customisable and tweakable: even the behaviour of the characters is determined by lines in plain text configuration files. The main changes since 1.1.1 are new theme tunes, new 'all shields' tunes, new 'open safe' tunes, new 'up a year' tunes and new lesson questions and answers for Skool Daze Take Too, Ezad Looks, and Back to Skool Daze. The new tunes (actually nursery rhymes and other traditional songs) are done in the style of the original Skool game tunes (i.e. rasping notes produced by code running in contended memory). Hopefully you'll be able to recognise some of them! 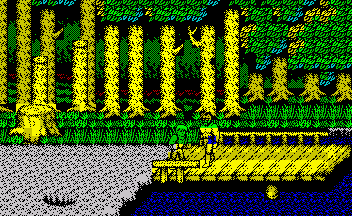 Ralf playing a bit with existing games code, adding colour here and there, changing this or that. If someone doesn't know - mod is a modified game with altered graphics, levels and gameplay to give a new fun with old engine. This is still old good Renegade but with a twist. As you can see this mod has new backgrounds, but that's not all. Play it and you'll see differences in the fight. This version is supposed to be a bit harder than original one but many people claimed that original Renegade is easy so here you are. Download SNA-version. TAP-version will be later. 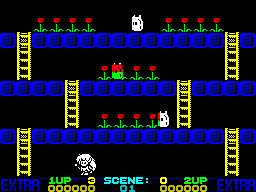 A freeware game for the 48K ZX Spectrum, by Phil Ruston 1986-2012. 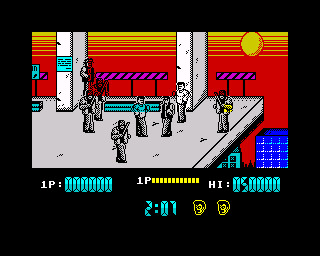 This is a remake of his first attempt at a machine code game which he originally made way back in 1986. Bounce through 20 deadly levels to reach and destroy the experimental reactor core (which has gone critical, as they do..) Open the door to the next level by hitting the key icons in order (flashing=target). Avoid the spikes and security systems and collect the bonuses. Moroz1999 проделал немалую работу - загрузил на Youtube General-Sound доработки спектрумовских игр. В коллекцию вошли как его личные работы, так и продукция более ранних годов от известных спекки-групп. Среди игр такие шедевры, как After The War 2, Commando, Barbarian, Renegade и другие.